The deterioration of security situation inside Syrian due to the nearly two years of civil war has forced a massive displacement of Syrian civilians both internally and across borders. The number of Syrian refugees in neighboring countries and North Africa continues to increase steadily. More than two and a half million Syrians have been uprooted from their homes, including more than 600,000 who have fled to neighboring countries, and an estimated four million Syrians are in dire need of assistance. The deterioration of security situation inside Syrian due to the nearly two years of civil war has forced a massive displacement of Syrian civilians both internally and across borders. The number of Syrian refugees in neighboring countries and North Africa continues to increase steadily. More than two and a half million Syrians have been uprooted from their homes, including more than 600,000 who have fled to neighboring countries, and an estimated four million Syrians are in dire need of assistance. In Iraq, since the government of Iraq (GoI) declared its border points open for Syrians, their number has reached 69,289 persons. 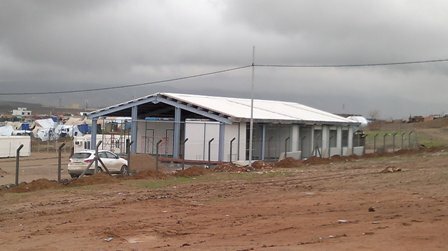 The majority of them are hosted in the region of Kurdistan, particularly inside Domiz camp, which is hosting an estimated number of This increased number of refugees has caused considerable challenge to the government resources, especially in the northern region of Kurdistan. As winter approaches and the weather conditions are worsening, vulnerabilities of affected people are increasing. Women and children who represent about 75% of the total refugees are the most at risk. Particular risks are connected specifically with camp settings, where living spaces are confined and infrastructures are weak and there are limited activities for both men and women to make them feel productive and worthy. In such environment, access to reproductive health information and services including emergency obstetric care and protection form gender violence is almost a challenge. 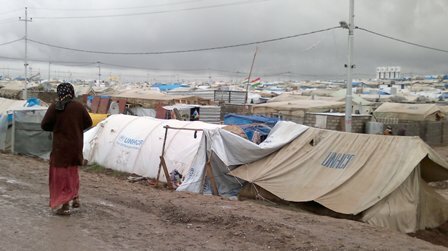 As a mandated agency, UNFPA Iraq office has conducted an assessment mission to Kurdistan region to assess the reproductive health and GBV needs of refugees living in Domiz camp including for the youth people. The report of the mission confirmed that reproductive health services are lacking both quantity and quality. Ongoing efforts to fill this gap are faced by lack of trained personnel and physical space. Consequently, UNFPA in partnership with the regional directorate of health (DOH), and International Rescue committee (IRC) is supporting a project aiming to provide reproductive health and GBV services to refugees women and young grils including for young people. As per this project, a women reproductive health clinic is under establishment in close collaboration with the DOH. The clinic will fill the gap in the camp to ensure than quality primary health care is provided to women. UNFPA support will be in mater of staff, equipment and drug supplies. Staffs who work in the clinic will receive a refreshing training on minimal initial services package on reproductive health. it is expected that the centre will encourage women in the camp to seek reproductive health services and to have access to quality services RH services including on antenatal care, family planning, postnatal care, treatment of sexually transmitted infections and gender-based violence. More importantly, the recruitment of a women female doctor is very crucial in such a very conservative population where women exposure to male is restr4duteced some times. Gender based violence; especially domestic violence is very common among Syrian refugees inside the camp. To prevent and protect women and young girls from its danger, UNFPA is supporting a multi sectoral prevention and response mechanisms. In partnership with UN agencies and other organizations working in the camp, a women space social centre is under establishment inside the camp with the aim to empower Syrian refugee's women in the camp in the economic, social, educational, cultural areas through awareness raising on issues pertaining to health, GBV and child rearing, and technical training and informal education.. The centre will serve as an entry point for UNFPA and its partners to help women who may have been victims of GBV including domestic violence at home. Importantly, it will provide a safe space where women and girls can come together to talk about issues affecting their daily life in the camp. Women through their committee in the camp are fully involved in the implementation process. Adolescents and youth is another group at risk with special needs, which is not addressed can led to negative impact on their daily life and future. They are jobless and no specific program is place to address their specific needs regarding access to RH information and services. To increase the resilience of the young in the camp, UNFP, in consultation with the camp management and other operating UN agencies and INGOs, is supporting the establishment of a public space within which training courses such as the role of youth in the humanitarian situations will be conducted to have a core of trained volunteers who can be as SRHR promoters within the camp. Worth noted that UNFPA support include also refugees living in other governorates hosting refugees. Recently UNFPA has delivered number of supplies to Ministry of the health that will be delivered to health facilities as part of strengthening the referral system as a way to improve their capacity to provide RH emergency obstetric care including family planning. Finally, as the Syria crisis continues to force hundreds of refugees out of their homes, RH needs have increased accordingly. To continue providing quality RH services to all refugees in the first half of the year 2013, UNFPA Iraq office has requested for USD 1,6 million as part of the regional response plan launched recently on the 19th December 2012.